Leslie Hughes is an amazing woman who saw a great business niche early on while most people were wondering what direction Social Media was going. When Leslie saw the potential growth and potential demand for Social Media experts she began studying it, one step at a time. While others were getting overwhelmed with terms like Facebook, LinkedIn, Twitter and a multitude of other names, Leslie watched who was doing what on each platform. That is why CBC called her a Social Media guru. And it is why Leslie Hughes, a graduate of NLP Possibilities With DHE, ( www.nlppossibilitieswithdhe.com ), and the Principal of PUNCH!media is our guest blogger today. Last week I asked Leslie about LinkedIn, after our discussion I asked if she would write a blog post for NLP The Common Denominator. 3 Easy Steps For Putting Your Best Face Forward On The World’s Largest Business Networking Site – LinkedIn! LinkedIn is the world’s largest business social networking site. It boasts over 300 million members with 2 new members joining every SECOND! While Facebook is where we connect to keep up-to-date on friends and family, LinkedIn is where we connect with professionals. It acts as an online resume featuring all of your greatest accomplishments and it also acts as your online Rolodex that can allow you to turn cold calls into warm introductions. And, when prospective clients are Googling you, your LinkedIn profile is often ranked on the very first page. What do people see when they Google YOUR name? You have less than 9 seconds to make a lasting impression. Convey that you are friendly and approachable with a warm smile. Ensure that you are the only one in the image and that it portrays you as a confident, competent professional. Move beyond the default setting that just features your role. Describe who you are and how you help your clients. Taking action on these easy 3 steps now will ensure that your first impression speaks VOLUMES about who you are, and that you’re the right person for their next opportunity! Leslie Hughes is the Principal of PUNCH!media, LinkedIn Optimization Specialist and Professor of Social Media. Leslie helps businesses save time and make money using tools such as LinkedIn, blogging, Twitter and more. With over 15 years in both traditional and online marketing and sales, Leslie has helped clients such as The Children’s Wish Foundation of Canada, TVO, and The Guardian Life Insurance Company of America build brand awareness and convert business. After emigrating with her mother from Kingston, Jamaica to Ontario, Canada in 1977, Alvin found that this was the impetus for a life-long journey into the study of success and how he could master the world to give him exactly what I wanted and desired. The initial journey took him into the world of athletics, where he conquered his first roadblock; the fear of fighting. Little did he know at the time that facing his biggest fear would then become the foundation of his new strength! Through his journey in boxing and later in dancing he had an epiphany that behind all fears is an ever greater chance for growth. And this epiphany lead him to move to an even greater curiosity what he could accomplish. He fell in love with the study of the human body, mind, and spirit, and for the next 20 plus years has delved into the formal and self-directed study of the mental, chemical (nutritional), emotional, physical, material, and spiritual realms, often referred to as the human essences. Alvin wanted to know what made some of us great, and some of us flounder around for years, lost in our own set of excuses and belief systems. In his quest for answers, he got his undergraduate degree in psychology, studied Neurolinguistic Programming (NLP), as well as mindfulness meditation and Buddhism. What he discovered through his years of study and work with clients. He realized that the world around us is a complete reflection/projection of our internal world of belief and experiences. This realization has lead him to creating one of the most comprehensive healing centers in North America. Where is Alvin Brown today? 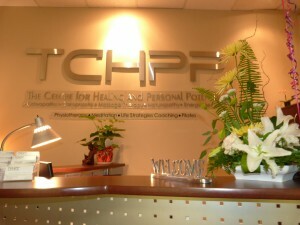 Alvin is the owner and clinical Director of TCHPP – The Centre for Healing and Personal Potential, www.tchpp.com located in Pickering, Ontario, Canada. He considers himself a Peak Performer and is passionate about helping people to live their lives at a peak performance level. This was the primary driver for creating the Integrated Peak Performance Program (IPP). At The Centre for Healing and Personal Potential Alvin has brought together a team of highly skilled, professional practitioners, who work as a unit, for people who want to take their game or their life, to the next level. The years, Alvin has invested, intensely studying the human body, and how to harness and tap the body’s inherent powerhouse, in order to heal, grow, change, and reach its maximum potential. He is a man who walks his talk. As well as assuming the role of the clinical director at TCHPP, Alvin has now earned his Bachelors Degree in Psychology and an honours degree in Osteopathic Manual Therapy. Alvin has also been trained in a number of therapeutic manual therapies. They include: Registered Massage Therapy, Registered Holistic Nutrition, Acupuncture and Chinese Medicine, Fitness Leadership, Master Practitioner of Neurolinguistic Programming, Applied Kinesiology, Therapeutic Touch and Reiki Energy Therapy, to gain a greater understanding of the elements many people can sense but not see. This varied range of skills allows Alvin to bring an integrated approach to his treatments, workshops, seminars and training sessions. 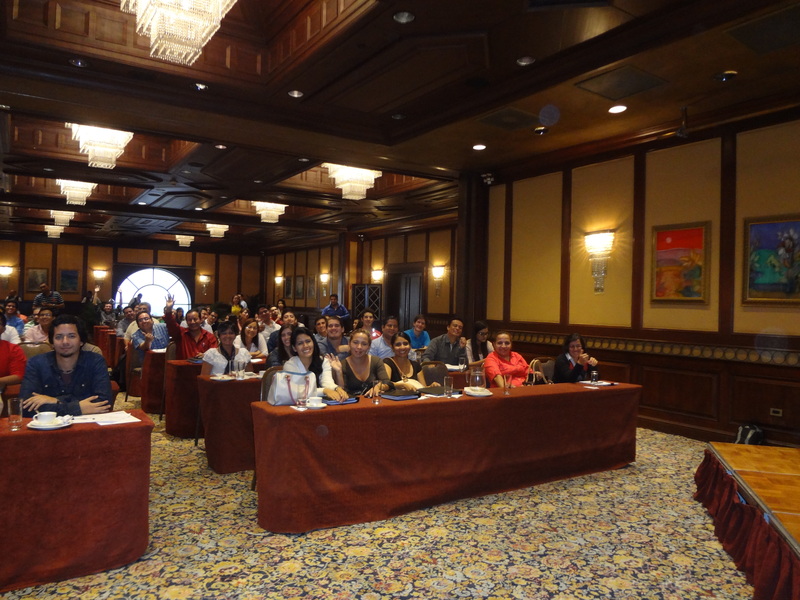 What was Elizabeth Payea Butler, Master Trainer of NLP With a Specialty in DHE doing in Ecuador in May 2014? This post is more geared to the many people who have studied NLP. The people who have graduated as NLP Practitioners, or NLP Coaches who are wondering about expanding their skills and working with children. Many years ago I designed a workshop for people who had taken their NLP training and wanted to use their new skills to assist children. I have taught this program in Canada, Germany, Japan, Italy and in May 2014 will be teaching it in Ecuador. This workshop has evolved and changed, and is never the same twice. Why? Because, there is always something new to learn and to teach, and flexibility and awareness is the key to a successful future when working with children. I have been working with children using NLP since 1993 and never cease to be amazed at how adaptable the brain is. I look at how a children born 8 years ago, is arriving into a different environment of change and technology than a child who was born 16 years ago. Technology is changing more rapidly than the average person can keep up, and these changes affect how children process information and act on the information they have processed. Common Sense is no longer common, and as NLP Practitioners, we hear this on many occasions. With over 20 years of practical, hands on experience, many people see me as an expert, and I draw on this experience and expertise to bring fresh ideas to the workshop each time that I am hoping will open the participants eyes and mind. ADD, ADHD, Autism Spectrum, are just a few common terms and labels we have heard often. But have you noticed how there are more, more labels being placed on children everyday. Learn how to calibrate more quickly the behaviour shifts and changes, how to set state anchors before a behaviour occurs. Learn what is important to the child and how to influence them by acknowledging what is important to them and giving them additional information. Discover how to effectively use the Meta Model when asking children questions. Understand the benefits of the Milton Model when answering their questions. Practise setting anchors that will quickly and easily re-shift their behaviour. Learn the importance of changing your strategies and behaviours more quickly. I will also address the unprecedented power and influence of the internet and social media on kids and the importance of working with this generation of future leaders before someone else does. I love working with children, click on this link: www.nlpforkids.com and see how the changing times have also caused me to change my strategies for how I work with children. Realistically, no one has all the answers. I do however believe that by working with children today you will have better sense of what is coming in the future. It has been awhile since I posted, and so much has occurred in the past few months. So let’s take a step back in time. 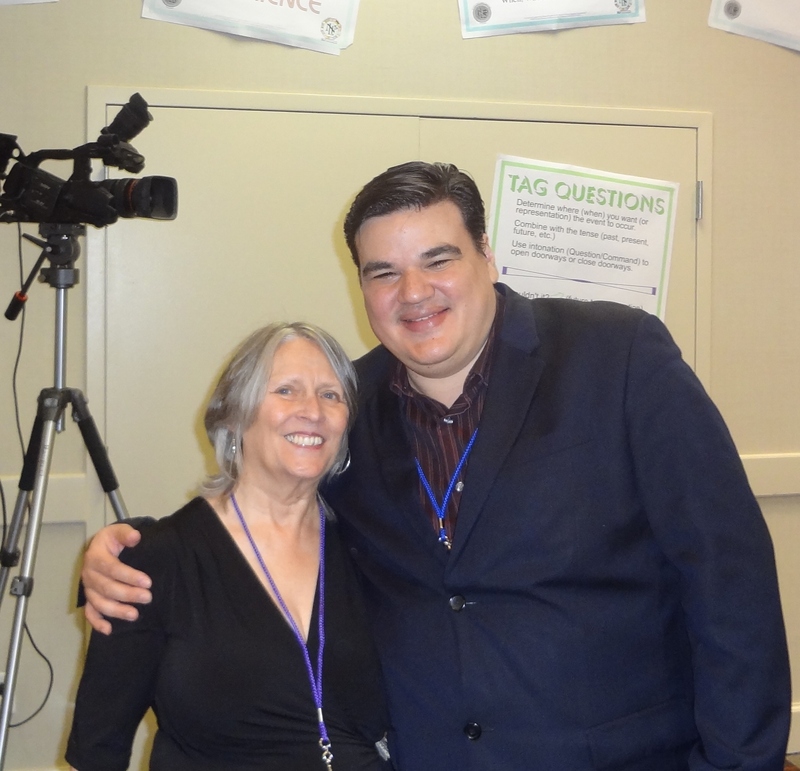 While I was in Orlando, Florida, at the NLP seminars with Dr. Richard Bandler and John LaValle, I was able to spend some time with my good friend Jose Torres, a Master Trainer of NLP, like me. Jose is the founder of NLP Ecuador, a thriving NLP Training Institute certifying NLP graduates through the Society of NLP. I have visited and worked with Jose on two previous occasions and was thrilled when Jose invited me to Ecuador to train with him again. This time it will be a little different. Jose and his lovely wife Maria Fernandez now have two beautiful children and since they are focused on growing with their children, he asked me to facilitate a program that I have designed for NLP graduates who have children or are working with children and want to expand their skills with children. So, in May 2014, I will be in Ecuador teaching the Using NLP With Children program to graduate of NLP, and having an amazing time. If you would like to learn more about my history of using NLP with children, simply click on http://www.thinkfasternow.com or http://www.nlpforkids.com either link will take you to a interview video of me. Even I was surprised when I realized how much I have done with NLP and children through the years. Many NLP Practitioners think that a child will respond the same as an adult to the NLP techniques. The reason the result the practitioner is looking for and not seeing is very simple. Remember a basic presupposition of NLP is “The map is not the territory”. An easy concept to remember is “All adults have been children, but not all children have been adults” Thus, the map is not the territory, but the territory is the map. Work with what is in front of you. 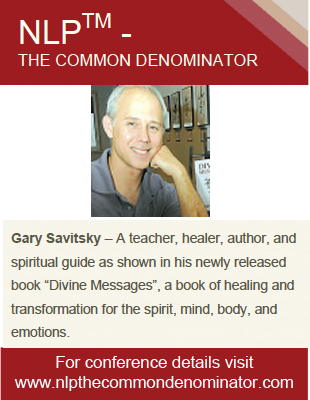 Meet Gary Savitsky, one of the eight guest speakers on our NLP The Common Denominator Conference Cruise aboard the Holland America Nieuw Amsterdam. This healer, teacher, and spiritual guide has studied the Asian martial arts and healing practices for over 30 years. Gary has published his first book “Divine Messages” a book of healing transformation for the spirit, mind, body and emotions. Gary blends NLPTM, energy and spiritual practices together with great success for groups and individuals. Gary shares his perspective on how we communicate with ourselves, our mind, our body and how these messages effect our lives and the lives of everyone around us. Gary recognizes the importance of work/life balance to ensure great success of both areas. Gary will be offering quick and easy ways to determine your state of balance and help you develop a plan to rebalance, regardless of your home or office environmental challenges. Below is a copy of the Press Release for Divine Messages. I highly recommend you purchase a copy of this book, and bring it along on the cruise, and ask Gary Savitsky to autograph it in person! Thunder Bay, Ontario – June 25, 2013 – Author Gary Savitsky will be launching his new book: Divine Messages: A Book of Healing And Transformation For Spirit, Mind, Body And Emotions, on Friday June 28, 2013 at the Creative Commons, 116 South Syndicate Avenue, upper level, Thunder Bay, Ontario. We are all seekers in some way. We seek to find meaning in our lives, we seek better health and vitality, and we search for some way to alleviate or eliminate our suffering or the suffering of another. Divine Messages is a message and energy book that contains guidance and inspiration to help you along your journey. There is a saying that goes, “ it is sometimes in the expression of another that we discover the truth within ourselves”. 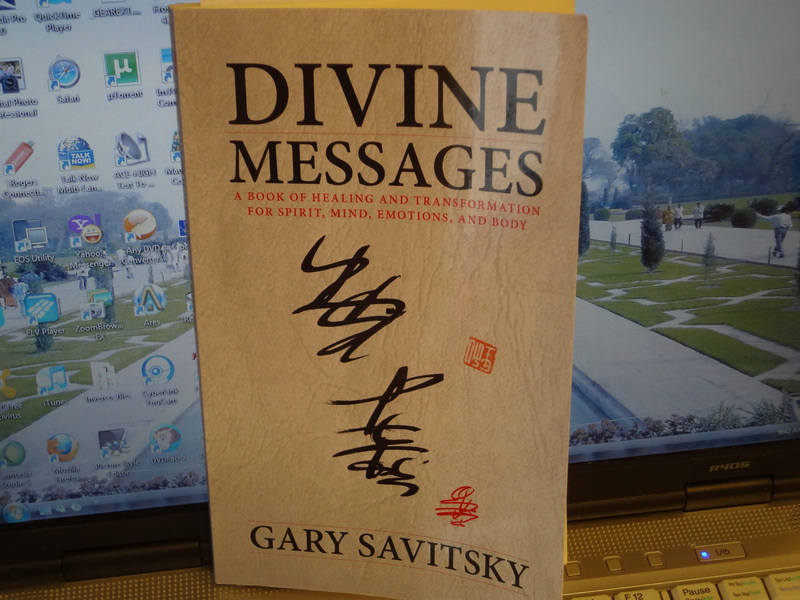 In a time where there is so much world struggle and dramatic change, the book Divine Messages is a welcome respite. At the book launch, all the inspirational spiritual artwork from the book will be on display. The book launch and art exhibition is free of charge. Copies of the book: Divine Messages: A Book of Healing And Transformation For Spirit, Mind, Body And Emotions, will be available for purchase at the cost of $19.95. Gary Savitsky is born and raised in Thunder Bay, Ontario, Canada, and continues to call Thunder Bay his home. Gary Savitsky is a dedicated holistic practitioner guiding many on their journey of healing, spirituality and self-discovery. With over 30 years of training and study in the martial arts, ancient Chinese medicine, Christianity, Buddhism, Taoism, Martial, Medical and Spiritual qigong and NLP healing modalities. Gary has travelled throughout Canada, the US and China to train and study. For more information about Divine Messages, please visit http://www.messageart.ca or contact Gary at 807-629-3759. A few years ago I was sitting in a restaurant in Amsterdam, Holland, enjoying a leisurely lunch with a new friend I had met while attending a wedding in Boston, USA. Amsterdam was a stopover on my way to Bahrain, UAE where I had been invited to do a 2 day training for a group of entrepreneurs. Over lunch, my new friend, asked what I did. He and his partner had only talked with me at the wedding, about the wedding, set on the hill of a beautiful park with only the sounds of musical chimes hung from the tree branches blowing gently in the breeze, the bride and groom, filled with love for each other and feeling the joy of their special moment, the food, prepared by friends and family, each bite flavourful with sweetness, and the loving location, overlooking the sun sparkled water, as unlimited as their love for each other. Our jobs or careers never came into the conversation. We simply enjoyed our time together and at the end of the day exchanged personal email addresses and telephone numbers before saying our farewells. In Amsterdam, I told him that I was a Communication Trainer, of NLP, neuro linguistic programming. Now I fully expected him to begin a barrage of questions beginning with what is NLP, and was surprised when he said he was familiar with NLP. Naturally I asked how. He explained that he worked for a large company in Holland, and that all the trainers regardless of internal or external must be certified in NLP. He told me that many people in his company take NLP for personal development and they put it proudly on their CV’s (resumes). He reached across the table and shook my hand, and with a smile said “congratulations on making a difference”. The lunch was delicious and the rapport (the wedding and NLP as the Common Denominators) was strong and I often thank my friends for the wonderful wedding in Boston, that lead me to a lunch in Amsterdam, on my way to a training in Bahrain. NLP stands for Neuro Linguistic Programming…….and it is all about conscious and unconscious communication. Many of you, who are visiting this blog have heard about NLP and may have attended some or many NLP courses. And then, there are some, who have only bumped into the 3 letters NLP casually. Regardless, this blog is dedicated to what people have accomplished with NLP when the class is over! This blog is about people who attended NLP courses and then said “now what do I do with it?”. Exercised their “take a chance for a change” gene and surprised themselves! Why is this blog called NLP The Common Denominator? I chose this name because it is about different people, from different backgrounds, different ages, and different levels of success and change, and yet what they do all have in common is the NLP certification course they attended, and their NLP Trainer. By the way, that would be me! Elizabeth Payea Butler, founder of NLP Possibilities With DHE in Toronto, Ontario, Canada.